There were a number of months last year that I didn’t have time or energy or free attention to write in this blog, or take pictures, or post them here. Too much else going on. So this is a kind of catch-up, perhaps even a teaser. I may have shown you some of these before, in which case you can simply skip past. Or not. 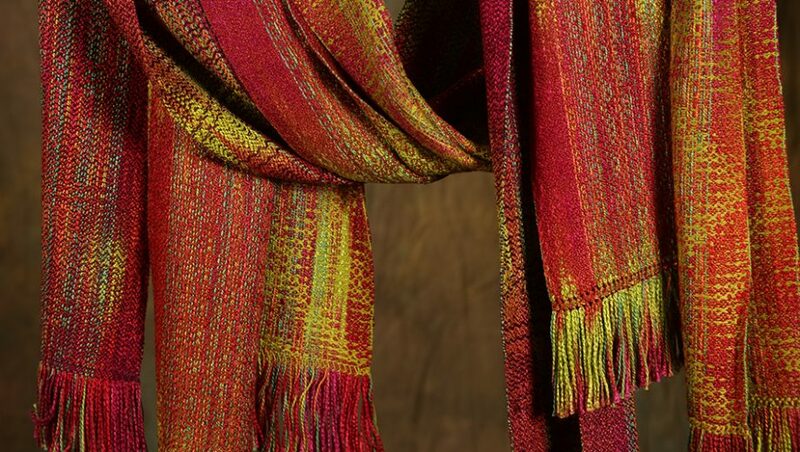 This is one of the Double Rainbow scarves — two different hand-dyed silks in the warp (lengthwise threads), set up as eleven-thread stripes, with a black tencel weft in a modified wave pattern. It shimmers. 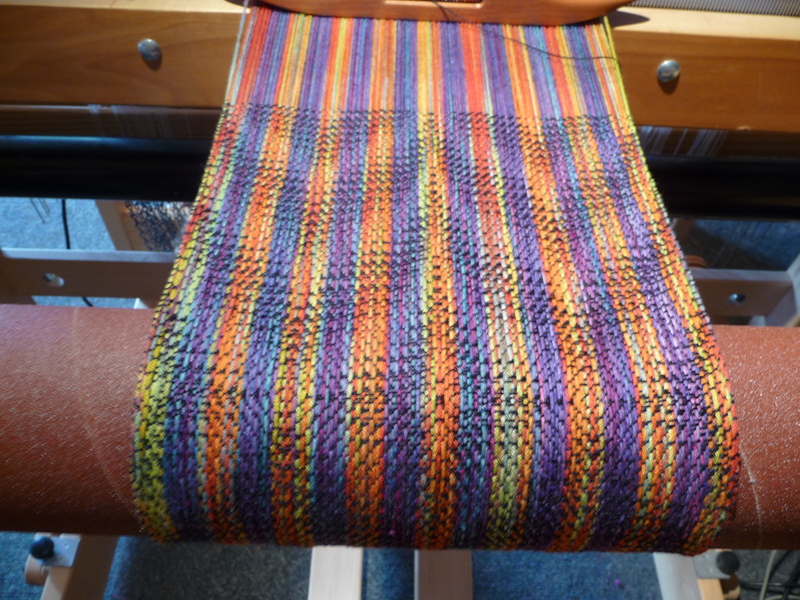 Here are three more of them, each with a different color tencel weft and a different pattern. These three are still available for purchase. 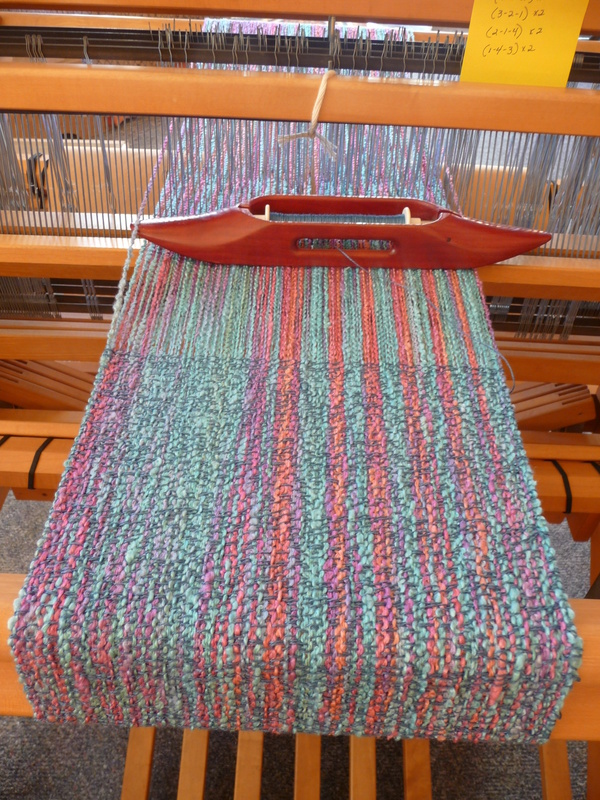 This is one of the Judi’s Choice series (the one for Judi herself) on the loom — three hand-dyed yarns in the warp (silk, rayon and cotton) and a deep teal tencel weft. There were two others in this series, both already sold. Here’s one of two Easter Egg scarves, this one woven with a dusty teal tencel weft, the other with a soft pinky-coral pearl cotton weft. 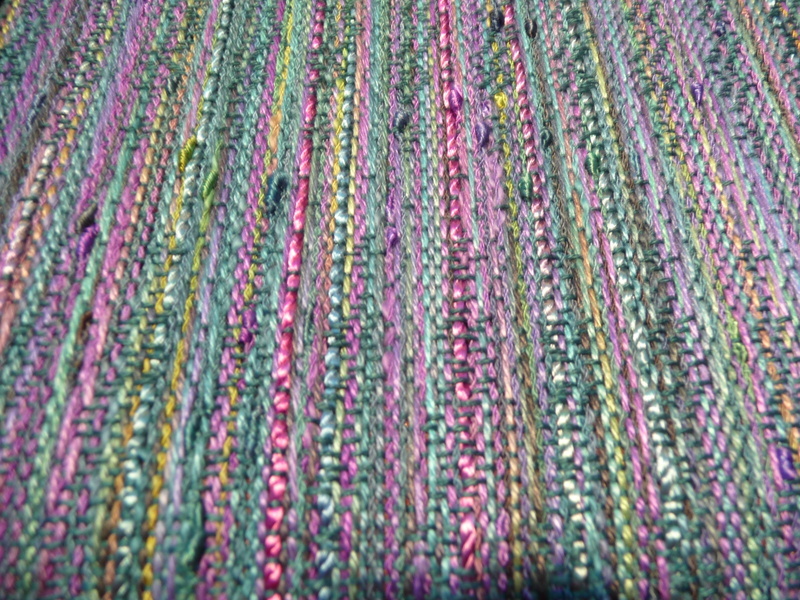 The warp is a bumpy hand-dyed rayon/cotton, very soft and interesting. 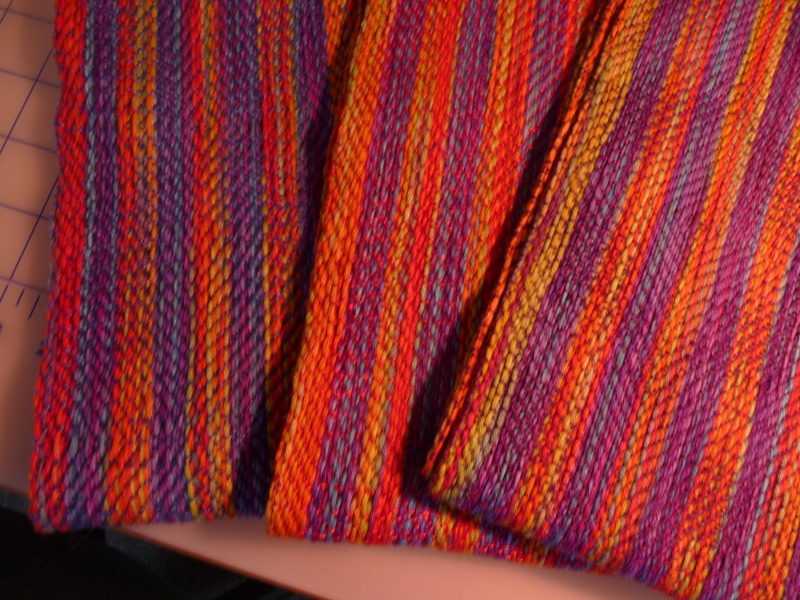 These were the last weaving I did on my original loom, the one I used exclusively for many years, just before it went to its new owner in February of this year. Both are still available. As I write this evening, I’m looking out the window above my desk into the garden, where this spectacular Japanese Maple is in the center of my view, and in fact is centrally located in the garden. 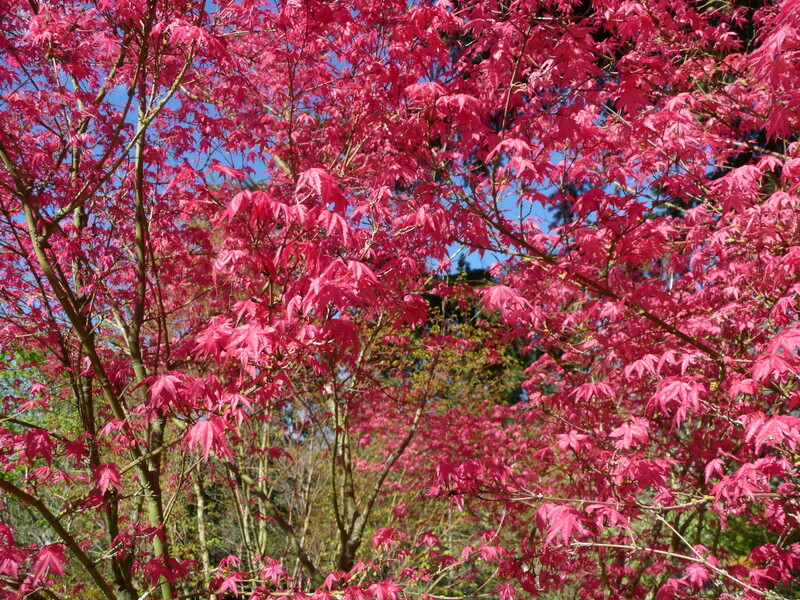 It’s Acer palmatum ‘Chishio Improved’, and holds this astonishing pink for a number of weeks in the Spring before slowly easing off to a bronzy green through the Summer before a final resurgence of red-gold in the Autumn. Is it any wonder that I love to work with strong colors? Gorgeous work on the scarves. All beautiful. The tree is matching our sunset tonight. Very warm out here in the Fraser Valley 28 degrees celius. Wish I could reel off the translation in Fahrenheit, but I will leave that to google if you are interested lol…..